30 minutes. Headphones recommended. Eyes open or closed. Loopable. Includes full usage guide. Most people only use a fraction of their potential brain power. This session helps you tap into that brain power and effectively “switch it on” – so you’re better able to think on your feet, stay focused, come up with ideas and find solutions to puzzling problems. 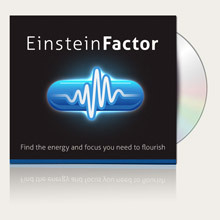 Alternating between high SMR (14Hz) and low theta (5Hz), EinsteinFactor allows you to bring the whole spectrum of your brain’s capabilities to bear on the matter at hand. Be prepared for some surprising and unusual thoughts!